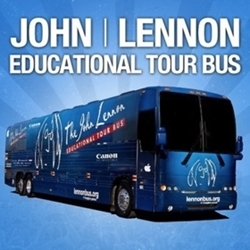 Yoko Ono and John Lennon Educational Tour Bus 'Come Together' to Support NYC Schools. Beatles Radio: The Beatles, Solos, Covers, Birthdays, News The Fab 4 and More! Yoko Ono Lennon has announced the return to NYC of the John Lennon Educational Tour Bus (LennonBus.org), the non-profit 501(c)(3) mobile music and video production studio, for a month-long tour September 15 - October 14. Entitled Come Together: NYC, this year's residency, the fourth annual, takes the state-of-the-art Lennon Bus studios to schools and public events across the city where students, visitors and guest mentors will create original music, videos, poetry, photos, and art. Throughout the month, the Lennon Bus will also be working with schools using a new curriculum entitled Come Together, powered by Nearpod which is designed to get students engaged in discussions and creative activities around peace.